I've had bread on the brain lately. I've been obsessed with yeast, actually. I'm on a mission to understand the intricacies and methods behind the elusive art of bread baking. In order to get closer to this goal, I've been doing 2 things: poring through Peter Reinhart's classic The Bread Baker's Apprentice, and diving headfirst into making yeast breads as I learn. One of the picks for my cooking club last month was this Rustic Potato Bread. I added rosemary and chives to make it Rustic Potato Herb Bread. This was a gorgeous loaf. The inside was quite moist, with a strong potato flavor and texture, while the crust was just the right amount of crispy. I'd highly recommend adding in some herbs during the kneading, although sadly I'd skip the chives, they were undetectable in the finished product despite my heavy hand with them. 1. Scrub potatoes thoroughly and cut into 1 inch chunks. Place potatoes and 1 tsp of kosher salt in a medium saucepan and cover with water. Bring to a boil, then reduce heat and simmer for about 15 min, or until potatoes are tender when poked with a knife. Measure out 1/2 cup of potato water and set aside. Drain potatoes in a colander and leave them to cool and dry for 20 minutes. 2. Pour the 1/2 cup of lukewarm potato water into a small bowl and sprinkle yeast over the top. Mix with a whisk until yeast is dissolved. Let stand for 5 minutes. 3. Place drained and cooled potatoes into the bowl of your stand mixer. Using the paddle attachment, mix on low speed for 1 minute to mash potatoes. Add olive oil and mix for another minute. Add potato water and yeast mixture and continue mixing until combined, 1-2 minutes. (If mixing by hand, place potatoes and olive oil in a medium bowl and smash together with a potato masher. Add potato water and yeast mixture and mix with a wooden spoon until ingredients are combined). Switch to the hook attachment and add flour and remaining 2 tsp salt. 4. Mix briefly on low speed to start bringing ingredients together, then increase speed to medium and mix for approximately 11 minutes, sprinkling herbs in, if using, halfway through. (If mixing by hand, add flour and remaining salt and mix with a wooden spoon. Knead with your hands for 10-15 minutes). Dough will appear firm at first, but will become wetter as mixing continues. Check for elasticity by flouring your fingers and stretching some of the dough. Finished dough should stretch about 2 inches without breaking. 5. Pull dough from bowl onto a floured surface and form into a ball. Place ball in an oiled, medium bowl and cover with plastic wrap. Let dough proof in a warm room, 70F, for about 45 minutes. Dough will almost double in size. 6. Place dough on a floured surface and flatten it with your hands. Form dough into a rectangle and, starting with a short end, roll dough away from you into a tight log. Stop rolling just before the log is sealed, then flatten the remaining inch of dough with your fingers and dust it with flour. This will prevent the loaf from fully sealing and will cause the seam to open slightly while baking. Wrap loaf, seam side down, in a floured dishtowel and let proof at room temp for 45 minutes. Dough will rise slightly and feel spongy to the touch. 7. Place a baking stone on center rack of oven and preheat to 400F. 8. Carefully unwrap loaf and set it, seam side up, on a baker's peel. Moving quickly, transfer loaf to center of baking stone and heavily mist inside of oven with a spray bottle of water. Bake it for 45 minutes, misting oven once more after the first 5 minutes. Finished loaf will be golden brown and sound hollow when tapped on the bottom. Let cool on a wire rack for 30 minutes. Yummy! I can almost smell the warm bread through the computer. This looks incredible! Question: Did you use active or instant yeast? I can only find active dry yeast in my local supermarkets and when I've tried recipes calling for instant yeast, I've failed. I'd like to try this bread (I love me spuds!) but I want to make sure I have the right yeast! Thanks. @ChubbyNewlywed Thanks! I did use active dry for this recipe. I was pretty puzzled that it called for either in the same quantity, but the active dry worked great. Enjoy! If you ever come across a recipe calling for instant yeast and you can only find the active dry, you can sub. Just multiply the amount of instant yeast that the recipe calls for by 1.25 for the equivalent of active dry yeast... and just remember that active dry has to be dissolved first, while instant can be added right to your dry ingredients. Hope that helps! Now, I really wished I know how to bake and make some bread! I want to try this one out! Amy, I SOOOOOOOO want to try out this recipe! I'm stopping at the grocery story today just to get these ingredients! Text me sometime to see how it works out for me (it'll keep me accountable)! Amy, I am forever grateful to you for posting this wonderful recipe. The one I made is a little different, I aimed to recreate the bread my grandmother made and your recipe was the perfect vehicle for that. I put two links to your site on my post. Thank you so much for sharing it. Hi, I know this is an old post....I hope you are still looking! 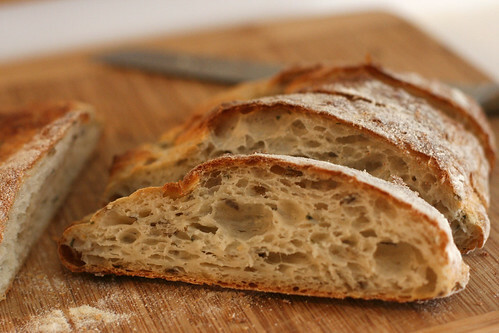 I want to make this bread soon. Yours looks just beautiful! Just how are you measuring the flour? Dip and sweep or fluff and spoon? There could be quite a difference in the amount of flour between the two ways of measuring. Better yet, do you know by weight how much flour should be used? Thanks!